Add Aromat when cooking to season and enhance flavour of vegetables, sauces, fries, eggs, meat and most savoury dishes. Can also be used as a seasoning in place of salt. 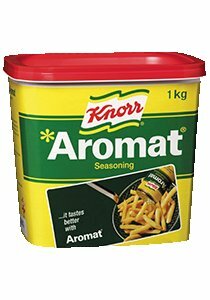 Use KNORR Aromat just like salt and pepper. Sprinkle it on sandwiches, burgers, salads or rub into the surface of meat just before roasting or grilling. Excellent for use in gravies, soups, pasta, rice and cream sauces. A great all purpose seasoning that can be sprinkled over cooked meat, chicken, vegetables, hot chips or deep fried foods. Quickly dissolves in boiling water at the required concentration.